These beautiful little morsels are very easy to make, but look and taste as if they took a whole lot of effort and skill. 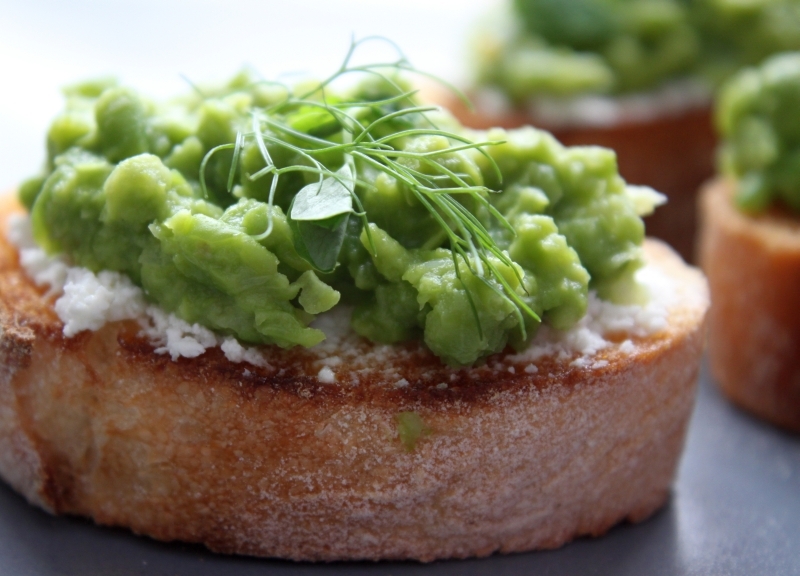 Peas are gently simmered in a little stock that has been flavoured with onion, garlic and fennel, then mashed up and piled onto toasted bread rubbed with fresh garlic and spread with some soft feta cheese. Fresh mint and snow pea sprouts finish them off and make them look just a little bit fancy. Miss 12 is on the adventure of a lifetime this month, singing in concerts and competing in an international choral festival in Italy. There’s just a little bit of family envy here at home, as the rest of us are in the middle of the much more prosaic round of work, study and exams. Making this recipe and catching up at the end of another busy day was not as glamorous as a gondola ride in Venice, but satisfying and delicious nonetheless. In a small saucepan heat the olive oil and gently fry the onion, the fennel, and 1/2 the garlic clove, finely diced, for 3-5 minutes, or until the onion is softened, but not coloured. Add the vegetable stock and turn up the heat. When the stock is boiling pour in the peas and cook for 5 minutes. Take off the heat, add the butter and season well with the salt and pepper. Use a stick blender to make a chunky mash of the peas. Do this carefully or else you will end up with pea puree – delicious, but not what is called for in this recipe. Toast the slices of bread under a hot grill and then spread each piece with a little feta cheese. 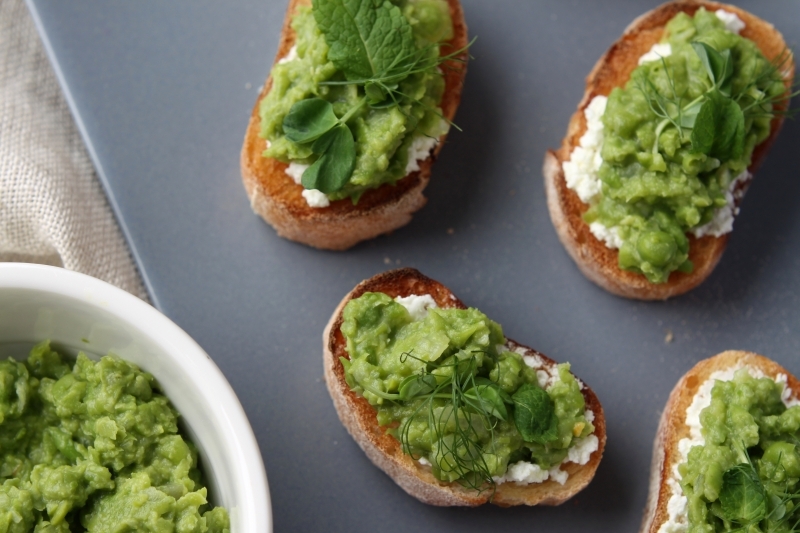 Pile on spoonfuls of the pea puree and top with some mint, a snow pea sprout and a few fronds of fennel. Serve warm or at room temperature.